We’d love your help. Let us know what’s wrong with this preview of All That You Leave Behind by Erin Lee Carr. An acclaimed documentary filmmaker comes to terms with her larger-than-life father, the late New York Times journalist David Carr, in this fierce memoir of love, addiction, and family. Dad: What will set you apart is not talent, but will and a certain kind of humility. A willingness to let the world show you things that you play back as you grow as an artist. Talent i An acclaimed documentary filmmaker comes to terms with her larger-than-life father, the late New York Times journalist David Carr, in this fierce memoir of love, addiction, and family. Dad: What will set you apart is not talent, but will and a certain kind of humility. A willingness to let the world show you things that you play back as you grow as an artist. Talent is cheap. A celebrated journalist, bestselling author, and recovering addict, David Carr was in the prime of his career when he collapsed in the newsroom of The New York Times in 2015. Shattered by his death, his daughter Erin Lee Carr, an up-and-coming documentary filmmaker at age twenty-seven, began combing through the entirety of their shared correspondence--1,936 items in total. What started as an exercise in grief quickly grew into an active investigation: Did her father's writings contain the answers to the questions of how to move forward in life and work without your biggest champion by your side? How could she fill the space left behind by a man who had come to embody journalistic integrity, rigor, and hard reporting, whose mentorship meant everything not just to her, but to the many who served alongside him? To ask other readers questions about All That You Leave Behind, please sign up. Erin: I have watched you in the middle of the city with a box of your office crap and alone in a room struggling to make beautiful important things. As someone who has seen a fair amount of talented young people up close, I can say that you are in the far reaches of that bunch. So wrote David Carr, the late New York Times columnist in an email to his daughter, the author of this heart-smart and dazzling memoir. Technically, this is Erin’s story of growing up, struggling through a string of internships, and finding her way into documentary filmmaking. But at its heart, this book is a tribute to David, the brilliant editor, former addict, and occasionally mercurial father. In fact, some of the best moments in All That You Leave Behind—a coming-of-age story set in the glamorous-yet-grimy world of New York media—are these father-daughter correspondences, which are by turns vulnerable, wise, whacky and ferociously affectionate. What’s interesting about this book is that it’s both deeply personal and universal. As a retelling of their relationship, it’s safe to say this book isn’t for anyone but Erin and David. On the other hand, by examining their bond, Erin arrives at a story that feels utterly relatable in its complications and kindnesses. This is not a book I normally would have chosen for myself, but I read it as an ARC, and I’m glad I did. It took me a little bit to get into it, maybe because I didn’t know either Erin or David Carr. But ultimately I found it poignant and insightful, both to the relationship between a father and daughter, and as an inside look at generational addiction. I was inspired by the author’s honesty in sharing her fears, struggles, mistakes, regrets, and her grief. I loved that she didn’t paint herself o This is not a book I normally would have chosen for myself, but I read it as an ARC, and I’m glad I did. It took me a little bit to get into it, maybe because I didn’t know either Erin or David Carr. But ultimately I found it poignant and insightful, both to the relationship between a father and daughter, and as an inside look at generational addiction. I was inspired by the author’s honesty in sharing her fears, struggles, mistakes, regrets, and her grief. I loved that she didn’t paint herself or her father in a perfect light, but instead laid bare their shortcomings in a way that made these unknown-to-me people come to life and had me rooting for and grieving with them. All That You Leave Behind is written by Erin Carr, the beloved New York Times columnist David Carr who passed away February 12, 2015. In this memoir, Erin Carr talks about her own struggles with addiction, which her father battled too as chronicled in his own memoir Night of the Gun. Erin's book is essentially about her relationship with her father who was also her mentor. She tells about how she faces many of the same demons (addiction) that her father did as well. What I liked the most about th All That You Leave Behind is written by Erin Carr, the beloved New York Times columnist David Carr who passed away February 12, 2015. In this memoir, Erin Carr talks about her own struggles with addiction, which her father battled too as chronicled in his own memoir Night of the Gun. Erin's book is essentially about her relationship with her father who was also her mentor. She tells about how she faces many of the same demons (addiction) that her father did as well. I really liked this book. I’m not big on media or movies or things like that, but still found the story compelling. It was a good tribute to her father and it was really easy to read. Back in my journalism days, I used to be among the masses who loved David Carr's writing. A highly renowned New York Times journalist, his columns and tweets were legendary among fellow journos, and I remember being enthralled when the documentary "Page One" came out. When I heard about his daughter Erin Lee Carr's memoir about his life and their relationship, I was curious what further informaiton she could provide about his life, separate from the gargantuan media reputation that he had both before and after his untimely death. Unfortunately, Carr's memoir falls flat of my expectations and wasn't able to hold my interest as I read along. The book is a chronicle of the relationship between David and Erin as they both struggled through addiction, careers and relationships with their families, but I found it devoid of compelling content and anything worth relating to. Instead, Erin Lee Carr sounded like a whiny, privileged girl the entire book through, making irresponsible choices, staying in denial, ignoring the feelings of people around her. I became annoyed with her the more she wrote about her life's experiences. Rather than providing a touching daughter's perspective into the life of David Carr, Erin Lee Carr made her father sound even more annoying and dangerous—which is eye-opening, for sure, but not in the way she was probably going for. And she also plays into that same tone herself, hyping up the party-girl reputation she had when she was drinking while not broadening her narrative into a deeper connection with her father. And indeed, Erin Lee Carr had so many opportunities to make All That You Leave Behind into a powerful memoir that connected father to daughter to community, but instead it was self-serving and frankly poorly written. She's a filmmaker, and that was obvious as I read along, since she failed to make meaningful stories or morals in her writing, the way that I kept hoping for and was disappointed about every time. Both she and her father have interesting stories if they were told properly, but it didn't work here. It was very disconnected and random in certain places, and the way she told the story didn't work with the content within it. Erin Carr you are a talented courageous truthful writer. You spoke from your heart and took us on your journey in life and the magnificent relationship you had with your dad. He will always live in your heart. We MN relatives say congrats on a job well done. Erin Carr is the daughter of well-know New York Times columnist David Carr who died in 2015. He wrote his own memoir Night of the Gun which chronicled his battle with drug and alcohol addiction. In this memoir Carr presents her own story of addiction but it's ultimately about her relationship with David Carr as both her father and mentor and how she faces many of the same demons he did. I read Night of the Gun when it came out and this book is a really nice companion piece to it. It was a really Erin Carr is the daughter of well-know New York Times columnist David Carr who died in 2015. He wrote his own memoir Night of the Gun which chronicled his battle with drug and alcohol addiction. In this memoir Carr presents her own story of addiction but it's ultimately about her relationship with David Carr as both her father and mentor and how she faces many of the same demons he did. It was a really great book. It totally painted a picture for me of her life and her relationship with her father. You don't have to know who David Carr is to enjoy the memoir. I had no idea who he was going into it and I loved it. A must read for anyone who loves reading memoirs. It made me want to go out and pick up David Carr's own memoir. Erin Lee Carr's dad, David has had more influence on my writing life and career than anyone. When he collapsed in the NYT newsroom, I felt like a big chunk of me went with him. If someone like myself, who'd never had the pleasure of meeting him felt this gutted, one can hardly fathom how his daughter felt. Till now. For anyone who has struggled with sudden loss, this book is. a must. It shines light on the darkest corners and leaves you with the comfort that you a Raw, honest, thought-provoking. For anyone who has struggled with sudden loss, this book is. a must. It shines light on the darkest corners and leaves you with the comfort that you are not alone. Others have been here, too. Having just lost my dad at 91 on January 1, 2019, I can relate. More-so, losing a dear friend suddenly in December. Sudden, unexpected loss has proved to be the cruelest loss of all. They were there, you just saw them, talked, and then...gone - missing - lost. Human minds were not meant to grasp it. And although we may learn to deal with it, it never heals - it never goes away. There is a blank place and I struggle daily to imagine a time when it might be filled. If it can be filled. Doubtful. Yet, there has to be hope, right? When we look deeply and take away the lessons to be learned, seek some understanding, and communicate with others who have suffered similarly, we can gain something from the sadness. In this over-saturated, media crazy, constantly buzzing world, we learn that talking is key. For those fans of David Carr, there are chapters in this book that are difficult to read. Although I've longed to know what happened the night he died, the loss and shock of his passing come over you like a wave again. I bawled my heart out. Same with the funeral and the remembrances spoken by Erin and her sisters, friends and colleagues of David. Sharing such personal memories and truth is brave and takes incredible courage. To say nothing of the details of Erin's struggles with alcoholism. Having followed her on social media for many years, I had no clue she was going through such personal turmoil. She gave all the signs of a talented professional in total control. How people function so well amidst such struggle astounds. In the end, it's humanness, courage, dedication and strength that bursts forth - in the book and in Erin's life. One takeaway is that Erin still communicates and learns from David on a daily basis. As one who frequently turns to his writing for answers, I found this comforting. David's words and advice are timeless. They are there, preserved for the ages, and thank God for that! There is much Carr wisdom plastered in the spaces of my daily life. It is helpful and enormously comforting. As David reminds us, "writing is choosing." No one got to the heart of the matter like he did. Erin is following and filling his big shoes. Lucky us. It's refreshing when a long awaited book proves to be all you expected. Of course, we're left wanting more and I feel certain more will come from Erin. She certainly has the storyteller gift. This is blatantly clear in her amazing films, but I'm hopeful that she will take up the pen and write more in the future. PLEASE, Erin! Your Dad is grinning from ear-to-ear. Of that we can be assured. And, thank you! Erin Carr is a celebrated documentary filmmaker and the daughter of the late David Carr, a well-known New York Times writer (and infamous, longtime addict) who died suddenly in the Times newsroom. In the memoir, the younger Carr looks back on her somewhat tumultuous life with her larger-than-life father. And though she recalls some harrowing moments throughout the years when her father fell victim to his addiction, what really stands out are the moments when he was just being her dad. And it’s clear that Carr was an incredible father. He was unfailingly encouraging and effusive in his love for her. He was constantly telling her how proud he was of her and how much he loved her. They had an extraordinary relationship, and as readers, we get to be privy to it with Erin Carr’s amazing collection of conversations via email, text, and G-chat that she has saved and shares in the book. In 2015, Erin Lee Carr's father, the journalist David Carr, passed away. This book travels backward and forward in time from that point, talking about Erin's relationship with her dad, their shared struggles with substance abuse, her career and personal life, and how she coped with his death. While this book tells a very specific story of Erin's life and the role her father played, it also tells a larger story of parents and children everywhere and how our lives weave together. As a parent and a In 2015, Erin Lee Carr's father, the journalist David Carr, passed away. This book travels backward and forward in time from that point, talking about Erin's relationship with her dad, their shared struggles with substance abuse, her career and personal life, and how she coped with his death. While this book tells a very specific story of Erin's life and the role her father played, it also tells a larger story of parents and children everywhere and how our lives weave together. As a parent and a child, I was able to see things from both Erin's and David's point of view - I thought about what I'm doing well and what I could be doing better. One thing that I really appreciated about this book is that Erin doesn't make her dad into a saint. It's clear how much she loved and looked up to him, but she's also open about some of his flaws. I think that's comforting to hear - you don't have to be a perfect parent to be a good one. I also really loved the how the emails from David to Erin show the strong relationship they had. At the end of the book, Erin incudes a list of "Things I Learned from David Carr," such as "Listen when you enter a room," and "Don't be the first one to talk, but if you do talk first, say something smart." He shared countless life lessons with his daughter, and I'm glad she shared them with me. Glad I didn’t choose this as my BOTM read and opted to get it from the library instead. Not quite sure where this memoir is going or what her point is (or if she even has one) but reading about 2 alcoholics and their problems is just so—boring? Unfulfilling? Frustrating? She was also given many privileges and opportunities, thanks to her dad's help and I felt like she was just a unappreciative whiner about a lot of it. Not my cuppa tea, and I am always leary of memoirs for this r DNF at page 99. Memoirs aren’t my go-to books to read- although when this book was one of the choices for Book of The Month I was excited to read it. I was engrossed in this book, I felt sneaky reading a book that was meant for someone else, but I couldn’t stop. Before this book I didn’t know David Carr, nor Erin but i now feel like I know them personally. This wasn’t a book glorifying her father nor herself. It was real and raw and she portrayed real struggles with addiction and grief. A great travel day read. I chose this BOTM selection on a whim. It’s not the type of book I normally read but I was definitely a daddy’s little girl growing up. My father and I didn’t have quite the same type of relationship but he did die suddenly just as I was submitting my dissertation. I was in the mood for a father/daughter story and this did not disappoint. I think I might pick up David Carr’s memoir when I get a chance. This is about Erin Lee Carr's addiction as much as it is about her grief over her father's death and her struggle to be in the world without him. She doesn't spare herself, but she's sensitive to her stepmother and sisters -- they're here, as they must be, but in parts, only as needed -- and generous with her father, sharing his emails and texts to her. If you've read The Night Of The Gun and/or followed David Carr's career, his daughter's book is a biting, bittersweet epilogue to his story. I received an ARC of this book via Netgalley. “All That You Leave Behind” is a memoir by Erin Lee Carr, daughter of late NYT media columnist David Carr. As one would expect, Erin’s memoir provides insight into her father as a journalist, a recovered addict and a parent. But what I really appreciated is how well these stories are told; that’s what makes the book so readable, so intriguing. 3.5. Surprised me by being a page-turner. But I followed her father’s career, read his memoir and mourned his death a few years ago, so it was interesting to see this other perspective and life so closely influenced by him. Like the author, I, too, have made a list of cathartic non self help books to read after a parent dies. This one is close to the top now. Thanks for writing this. 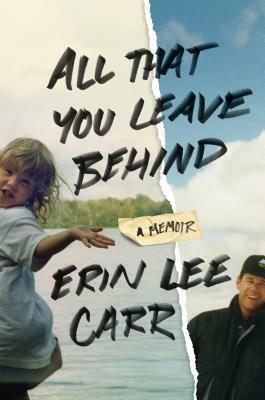 I really enjoyed Erin Lee Carr's memoir “All That You Leave Behind.” She writes about family, addiction, recovery, and trying to keep going after tragic loss. Beautiful, raw & honest memoir. As someone who has lost a parent suddenly, I could relate to her grief & some of her coping mechasisms.